Here is HH1X #3! 11 weeks from order to delivery. Thanks to Mickey for help with the specifications and Jeff for picking the woods. This one has the new Kiesel Holdsworth updates. The body is about 1/8" thicker and the neck heel carve is slightly more tapered for even better upper fret access. It plays beautifully (as they all do). A welcome addition to your HH1 family. I'd love to hear how you like the changes to the model. Like some sort of beast stalking the shadows. Best HH1X I've seen. Congrats! It's quite nice--but JBird pre-empted exactly what I was going to write--the koa model is the most beautiful by a mile. I think that it is the one that should be in the center. However, it's one of the most--if not the most--unique slabs of figured walnut I've seen. Enjoy the unwholesome foursomes you all will have! (I'm in a filthy mood... I just wrote a song called Rated X today). I'll be very curious to hear how you feel this one differs sonically versus your others, if at all. It should be nearer to the koa than the alder/maple would be to the koa (tops on a nice thick hog body are primarily decorative anyhow.. I WANT to believe they add to the tone but I don't in my heart fully believe they do). Wow! Now that's a quiver of guitars, huh? My sincere congrats on the unique build. * does the new body thickness shows any impact on the neck hight over the body top? * please elaborate a bit on the v.2's tapered neck heel: is it just shaved shorter, or does it offer any other key feature, in your opinion? Congrats colossal, you are definitely now the curator of some of the best HH1s ever. I like how you've kept with a similar design on all 3 - it really lets the natural beauty of the wood tops do the talking. Thanks for all of the nice comments guys. Once again, the build quality is really top notch. This guitar is quite light, very much on par with the alder/maple HH1X. The all koa is the heaviest of the three. The tone of this one is superb. It has the stock 6mm 500k pots. The Luminlay side dots are fun. The action will need some adjustment but it played great out of the box. Fret dressing is superb. They got everything just right. @Casual Madman: Yes, I see either a moth or maybe a spider! @Jbird and Doctor Turn: I agree, the koa is very special. But each is unique and I like them all! @Toejam and Skully: I am really pleased and I look forward each day to playing them. They are amazing guitars and I have found my muse. @Coda: I definitely have a thing for the natural beauty of wood. I keep thinking of getting one with a stain (Tiger's Eye or Denim) or paint (McLaren Yellow), but it hasn't happened so far. There's always the next one though! I love the look and feel (or lack of feel because of the STJF) of ebony so am sticking with that for now. Chris, I sat down to compare the new Claro/Mahogany (v2) to the Koa (V1). Both guitars are equally loud acoustically. When plugged in, they both exhibit the touch sensitivity/dynamic qualities of blooming depending on how hard a note is picked. However! The Claro/Mahogany most definitely has a different tone. There is much smoother top end that is sweeter and more rolled off (without losing any clarity) where the Koa has a more biting, cutting, nasal quality to the top end. The Claro/Mahogany reminds me of how a Strat sounds when played acoustically; where you hear the distinct plucky, bell-like sound you get from the pick guard and that pickup route below. I don't mean this in a bad way at all either. It sounds killer. Of late, I have been shaping my clean sound more toward the Eric Johnson vein and I have to say, this guitar really gets that sound. With the stock electronics, I roll the Volume off to about 7 and the Tone to 8 and there it is. ChrisN wrote: Does the new body thickness shows any impact on the neck hight over the body top? No, the neck height as it protrudes out of the body is the same. ChrisN wrote: Please elaborate a bit on the v.2's tapered neck heel: is it just shaved shorter, or does it offer any other key feature, in your opinion? It is just shaved a little deeper on the sides, that is all. The heel shape is the same but the area above it is a little more like the neck shape. I think it might have been done for increased upper access but also to compensate for the very slight increase in body thickness. I need to take some measurements with calipers to be sure of the actual increase. Such an awesome HH collection!!! Now that's pretty rad! Nice job they did! Dave, I appreciate your insight comments. I am totally positive it's a monster tone machine. My last (hopefully so) question is whether you regard the bell-like snappy acoustic/clean tone more as a consequence of the tonewoods chosen, or more possible due to the introduced production mods? Before I pull the trigger for the HH1Xv.2 I would need to evaluate the sonic/tonal differences between v.1 and v.2 having in mind a specific tone woods benchmark that currently lives up to my expectations regarding the guitar's specific tonal balance. Thanks again! Can I just ask... what is the advantage of having a bridge only pickup? why not have a neck too? @ElfDude and Aliensporebomb: thanks a lot guys! ChrisN wrote: Dave, I appreciate your insight comments. I am totally positive it's a monster tone machine. Chris, I love this guitar. The difference in tone is quite surprising and it is not a small difference either. So far, for chords, I absolutely love it. I need to do some lead single note stuff to form an opinion on the lead tone. Also, I still have the stock electronics (but planning to change it). I think the production changes were probably intended to address increased sustain, but I can only speculate. Unfortunately, I really cannot tell if the difference is due to the production change or the wood. My suspicion is the wood. The tone of the guitar is very different. The koa and alder/maple, while still sounding extremely resonant, have a brighter, clear, nasally top end. The mahogany/claro has clear top end without any of the biting, nasal quality. The koa sounds more like a solid body in that way. It is very well balanced though. 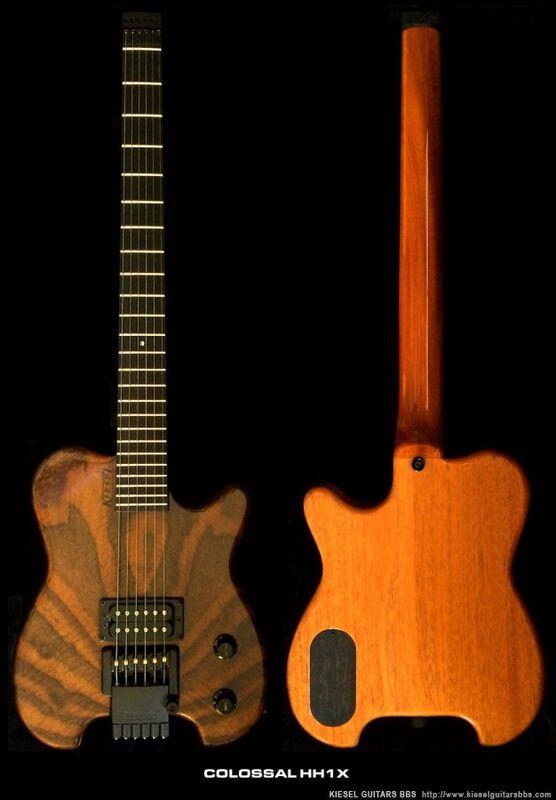 The mahogany body has more low mids with the top rolled off. The highs come across more strat-like in that they are plucky and bell-like...that's the best way I can describe it. It doesn't sound anything like a Les Paul. Thanks man. The story with the bridge only pickup choice for me has a few reasons behind it. First, I've followed Allan Holdsworth for many years and came to recognize him as something of a musical genius as well as an innovator. He has had a long relationship with Carvin and now Kiesel with his signature line of guitars. He has cited his musical influences to include the great jazz horn players such as Coltrane and Adderly and his guitar lead tone is very reminiscent of horn, oboe, and cello with a very singing, midrangey quality. If you look at the guitars he used where this quality in his playing began to really emerge (custom Charvels and Ibanez), he seemed to select for just the one pickup. I read the reason was that he never really used the neck pickup, but more importantly, having just the one pickup lessened the overall magnetic string pull which dampens string vibration. Holdsworth also uses 8 gauge strings (on his headless guitars) so minimizing string pull would be very important in maximizing sustain. He has always stated that using distortion was a necessary evil to achieve the kind of sustain that wind instruments have. For the choice of pickup, they were always underwound neck pickups with Alnico V magnets and double screw pole pieces. The double screw poles enhance the midrange. This whole approach is part of the system. For my own playing, some years back, I began to really rethink what I was doing and wanted to go more in my own direction and move away from playing the same old stuff I had been recycling for years. I was in a rut, not progressing, and wanted a change. I had always had my eyeball on the Carvin Fatboys, but when the HH guitars became available, I knew that was what I wanted and glad I had waited. 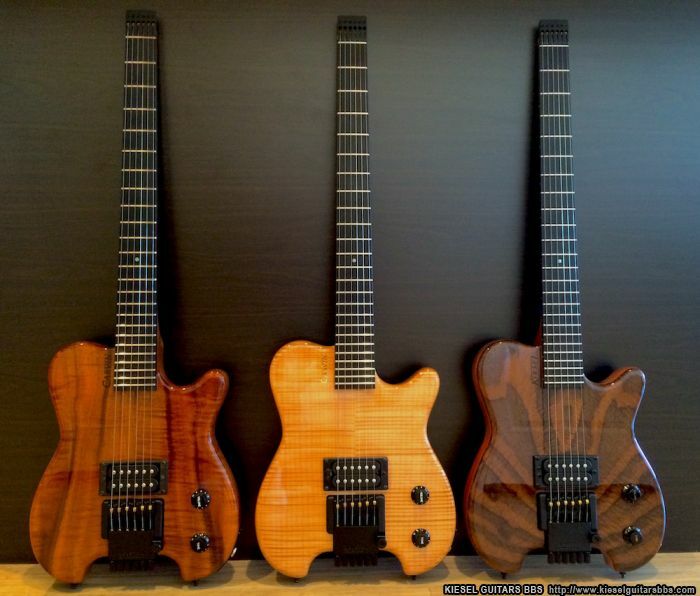 Holdsworth has always been very specific about his choices and the features of these guitars are very much in line with everything I always wanted. I am something of a minimalist. So part of the process of reinventing my own playing and really loving the Holdsworth tone and approach, I went with the single pickup option. I too play 8 gauge strings and modify the electronics to change the stock voicing slightly. I have studied what Holdsworth does not to be a fanboy clone, but to use that systematic approach to achieve a singing, sustaining sound. I like ultra light gauge strings as I dump the action down really low and like the legato style for single note lines and I also retrained the way I fret and am now very relaxed. Also, I wanted to focus on getting a variety of sounds out of the single pickup. I use my Volume and Tone knobs a lot. Can it do a pure neck pickup sound? No, but it will do what I want. But no, you can't slap a Dimarzio Super Distortion in there and expect Pat Metheny or even Allan Holdsworth. So on the surface, it's only one pickup, but there are many supporting elements to getting the sound: electronics changes, pickup winding and output, string gauge, action, and most importantly...technique. Sorry for the long story but that's the reasoning behind my choice. Sure thing. I get what you mean and have seriously thought myself of getting an HH1X with just a bridge pickup! Unreal! Man, that's a complete standout! Mooseboy wrote: Unreal! Man, that's a complete standout!